Rob Ninkovich’s consistent play has earned the respect of his teammates, such as fellow end Chandler Jones. FOXBOROUGH — Disinterested, disgruntled, and on one memorable occasion completely disgusted, Rob Ninkovich had every intention of quitting. Ninkovich, then a teenaged eighth-grader in the Chicago suburb of New Lenox, Ill., exceeded the youth football weight limit, so he decided to give wrestling a try. He hated it from the start. As a 180-pound heavyweight, Ninkovich was paired against bigger, more experienced wrestlers. The worst was when he hit the mat after another wrestler in a prior match had vomited. So Ninkovich, as teens sometimes do, complained to his parents. Mike and Deborah Ninkovich, as sensible, responsible parents often do, delivered an answer the teen didn’t exactly appreciate. Only he didn’t. It wouldn’t be the last time the future NFL defensive end chose not to quit, and the Patriots are better for it. Because of the lesson handed down years ago to Ninkovich — the son of an iron worker, and the grandson of an iron worker — he knew that when life appears to take an unsavory turn, something sweet might be waiting right around the corner. He’s seen it in his professional life, and his personal one. Before Rob Ninkovich became the player who will start at defensive end for the Patriots on Saturday in their playoff game against the visiting Baltimore Ravens, he was a senior at Lincoln-Way Central High School with no college scholarship offers. 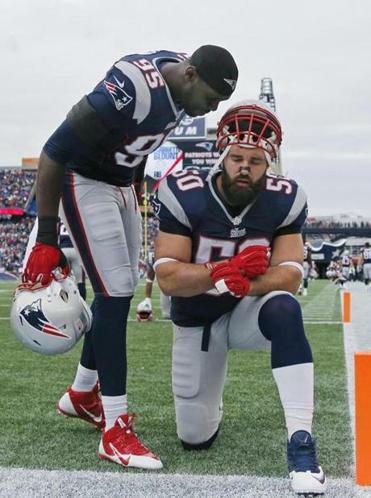 After spending two years at nearby Joliet (Ill.) Junior College, it took Ninkovich one day to convince himself he’d someday play in the NFL. Back to the day that convinced Ninkovich he’d become a pro. Some saw Ninkovich’s drive to succeed right away. Some still see it. The only place Ninkovich didn’t want to go after leaving Purdue was the place he wound up going. As the fifth round of the 2006 NFL Draft was beginning, Ninkovich thought he’d be selected by the Patriots, who had the 136th overall pick. Instead, he went No. 135, to the New Orleans Saints. That’s primarily because he met his wife, Paige, while briefly playing for the Saints. He and Paige are the parents of an 18-month-old daughter, Olivia. Spend some time with Ninkovich and details emerge. He’s humble but has always been extremely confident. He’s stubborn but responds best when coached by old-school, military-type (his words), strong individuals (sound like anyone in particular, perhaps favors a hoodie?). He’s quiet, but not afraid to speak up. “I’m stubborn. I would say it’s helped me get to where I’m at, because I was persistent, and being stubborn helped me forget about things that could have kept me out of the league,” Ninkovich said. “I think that goes back to having confidence in yourself. I was always confident that I could get to a high level and play at a high level. I just needed the right chance, the right opportunity. Life’s all about opportunity. That was in 2007, when Ninkovich ended up appearing in four games for the 1-15 Miami Dolphins. His first three seasons in the NFL were marred by injury and uncertainty. He tore knee ligaments twice and was released four times, bouncing between the Saints and Dolphins, active roster and practice squad. When he signed with the Patriots on Aug. 2, 2009, Ninkovich had eight NFL games to his credit, a question of what position he’d play (defensive end, linebacker, long snapper), but the unwavering belief that all he needed was a chance. Bill Belichick, the Patriots, and defensive end — although he filled in at long snapper against the Chargers this season — have all been perfect fits for Ninkovich. Certainly not Ninkovich, who compares his job at defensive end to a chess match. “There’s something about being a defensive end . . . that guy [quarterback] is a target, I’m going against someone that’s trying to stop me. That’s a great challenge, to go against somebody that’s trying to stop you from getting to his prized possession. 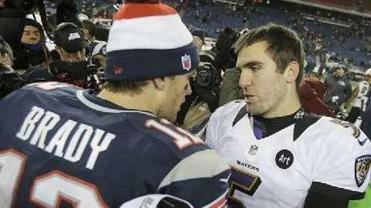 If you can consistently beat that guy, it’s fun, there’s nothing like it,” Ninkovich said. “It’s all a mind game of where you’re going to be, how’s [the offensive lineman] going to set you. Do you go with power, do you run around him, do you come underneath him? He’ll be chasing Ravens quarterback Joe Flacco on Saturday, looking to add to the team-leading eight sacks he had in the regular season. That’s been a popular number for Ninkovich: He had eight sacks this season, eight sacks last season, eight sacks the season before. He had eight sacks as a senior at Purdue, and eight sacks as a junior. Counting the playoffs, Ninkovich has 39½ sacks in his six seasons with the Patriots; he’s missed just one game during that time, and has started every game in each of the last four seasons. It’s his body of work — the durability, consistency, productivity, and nose for the ball (13 fumble recoveries the last five seasons, which leads the league) — that’s endeared Ninkovich to his teammates. All this from someone who, because of injuries and pink slips early in his NFL career, had opportunities to give up the chase. Maybe the unhappy wrestler in him still lingers, because Ninkovich kept pressing on, despite being told by some NFL coaches that maybe he wasn’t good enough. Why didn’t he just quit? “Because I knew deep down that I could play,” Ninkovich said. “In high school, I knew I could play higher. In junior college, I knew I could play higher. In D1, I knew I could play in the league. When I got here, I knew I could start, make a lot of plays, have a good career.